Fantastic Night and Day staff! good location with clean rooms and modern amenities. Truly an all round fantastic stay. Will be back again. The beds and pillows were comfy ! The staff were very friendly and helpful ! There was a cafe and bar down stairs and a common area ! Very good security, clean rooms and cleanest bathrooms I’ve been in, have soap and tissues provide, great location, would definitely go back again ! If i could vote more than 5 of value for money ı would absolutely vote. It was my second fav hostel in the world. It was amazing. I couldnt expect more than what i saw. Stuff was lovely and helpfull. It was the cleanest hostel that ı’ve seen. There is a metro station infront of hostel. You all should stay there if you’re going to Berlin. One of the best places to stay in Berlin if you are planning to check out the sights in Berlin. It is very well connected to the ZoB and the Hauptbahnhof. The nearest U-bahn station is Senfelderplatz and you can take the u-bahn U2 to alexanderplatz S+U station and then go anywhere you want. The rooms are not very large, but for the price, are large enough. I stayed in a 4 sharing room, which had almost enough space for 4 people and luggage. Even the bathrooms are clean and tidy. Comfortable beds and clean rooms. Just the kitchen is not good equipped and curtains for the beds would be nice because the little bed lights are really bright and I had some rude girls on my room who came in the middle of the night and woke everyone up. All in all good value for your money. 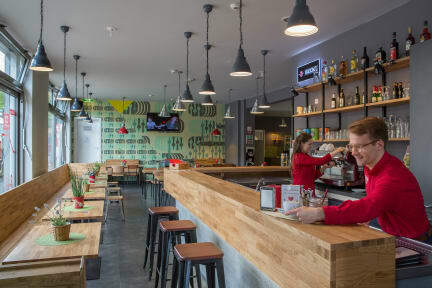 I really love the trendy Prenzlauer Berg area and this hostel is in the perfect location for brunch, boutiques and the Saturday street market on Kollwitzstraße. Just 2 underground stops from Alexander Platz and with a bio supermarket at the corner of the street. I stayed in a 4 bed dorm with my own locker, bedside light & plug socket. A towel was also included. Hope to visit Berlin in the future and will def consider booking here again. If you are here in Hostel World I assume that you are looking for a hostel. This is not a hostel. It doesn't have the hostel atmosphere, doesn't have activities, has a very very poor bar for what a hostel normally offers. The staff is not welcoming. I felt deceived. There they call the place a hotel and the atmosphere is that of an economic hotel, not an internacional travelers place where people want to meet other people to travel or hang out with a beer. I don't recommend it. My stay was okay, but compared to previous meininger hostels, this one feels like its been neglected. The bed was fine, and there was a lockable drawer which was good. I was glad to find a washer and dryer to rent. However on arrival the room was stuffy and smelt disgusting. The kitchen was small and cramped and never seemed clean (to the point where I washed everything before I used it and didn't want to touch the tea towels). Also disappointed that the only communal space was the bar upstairs.